Luxuriate on the Varkala beach, watch the sunset, explore magnificent temples and also get a taste of Kerala’s stunning backwater beauty. This luxury package features secluded and relaxation oriented beach & backwater experiences with little travel time between destinations. You will be welcomed at Trivandrum International airport / rail station by our company representative who will direct you to your resort. The city of Trivandrum showcases the heritage of Kerala like none else. With famous temples, palaces, museums and art emporiums, a tour of Trivandrum will as exciting as it is insightful. 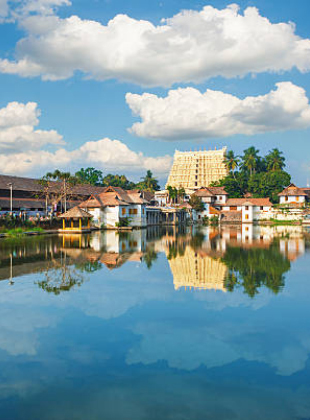 As the day unfolds, head to the Padmanabhaswamy temple, the richest temple in the country with antique riches. After darshan explore the horse palace (puthenmalika) - magnificently crafted wooden palace famous for its house sculpture work. Later, revel at the oil paintings of the raja and exquisite collection at Napier Museum. Relax for the day at your resort. Today you head to Kollam, one of the oldest ports in the Arabian Sea. Surrounding the hectic centre town are the calm waterways of the Ashtamudi Lake. Fringed with cashew plantations, coconut palms and traditional villages, this is a great place to get a feel of the backwaters without the crowds. Check-in to your backwater resort and spend the rest of the day enjoying the scenic environs by the lake side. You can take the cruise boat or a punt boat trip from the jetty at the end of the day and meditate peacefully as you watch the sun go down over the lake. Relax for the night in your resort. Today is set aside for you to explore Ashtamudi and really soak-in the backwater village culture. If you like to stay indoors, you can relax undisturbed in your own private garden or rest under the shade of coconut trees with gentle breeze from the lake.Day trips and activities are good too. Taking a stroll through the village around your resort will be a fascinating experience. You can watch the process of coir making and pick up some coir handicrafts too. There is always a festival on somewhere, just go and immerse yourself in the sound and colour. Activity oriented can take day trip to Thenmala ecotourism or Palaruvi waterfalls. After the tranquil backwaters of Kollam, you head to your final stop, Varkala, one of the best beaches in Kerala. Use this chance to pick up some activities of your choice for the next couple of days. Enjoy the awesome sunset and relax for the day here. Today is set aside for you to explore Varkala and pursue activities of your interest. There are quite a few in-house activities like yoga, learning to cook with spices, or ayurveda. The outdoor options include temple tours and village tours among others. Choose a couple of activities of your interest and enjoy a slow holiday. Start your day with guided yoga by the beach side and spend your day pampering yourself with ayurveda. The 2000 year old Janardhana temple atop the hill is a must visit and adds an element of mysticism to Varkala. The pious mineral springs, fishing hamlets of Fort Anjengo are other popular outings you can consider. Evening would be a great time to watch a dance-drama Kathakali show. Today is the last day of your tour. Enjoy a splendid breakfast at your resort and head to Trivandrum for onward journey. Drop back at Airport/Rail station in the afternoon bidding farewell to god’s own country with memories to last for a life time.